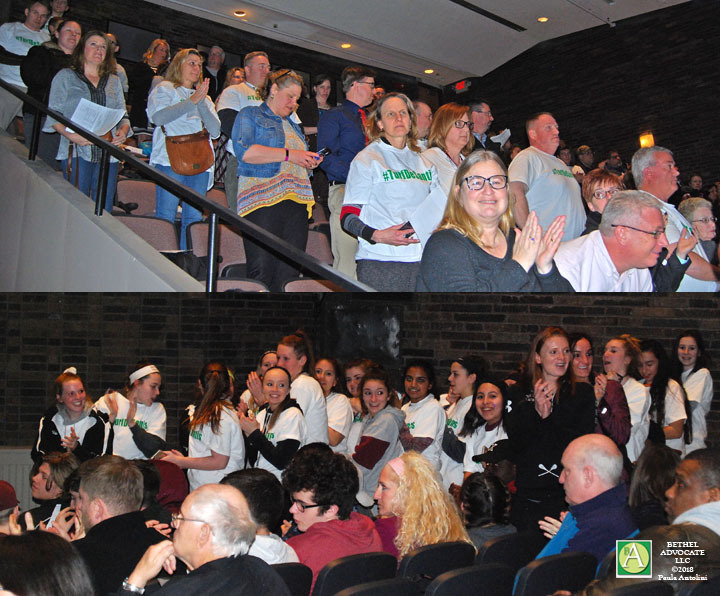 Photo above: Students and adults wearing #TurfDeSantis T-shirts in support of a new Bethel Public Schools turf field, at the Board of Finance public meeting on March 20, 2018. The turf field project was just reintroduced into the budget by the Board of Finance vote at their last meeting on March 22, 2018. I personally don’t care if the new turf field is covered in grass, corncobs, gold, or Chips Ahoy cookies. However, I do think it is irresponsible to spend a million dollars on a turf field while our students remain unsafe in schools. WHAT are they THINKING? As a parent of a child who has participated in Bethel track and field sports for years, I should want the best sports facility possible in Bethel for my child and all students. The dilemma here is one of priorities. Should taxpayer money be spent on school safety or a new athletic field? I think the answer is clear and so did the Board of Finance when they removed the turf field from the budget, as indicated during the March 20, 2018 public meeting. Now it’s back in the budget. Why? At the March 20th Bethel Board of Finance public meeting I witnessed a large crowd that included approximately 60 pro-turf-field students, and many adults. Many of these individuals were wearing white T-shirts that said #TurfDeSantis and many signed a pro-turf-field petition that was presented to them at the entrance. Citizens were allowed to publicly comment on the turf field despite the fact the topic was not in the budget agenda for that meeting. This is not according to protocol. Resident Billy Michael even mentioned this point to the Board of Finance Chairman Robert Manfreda, but people were still allowed to speak on behalf of the turf field nonetheless. My first thought, as I observed numerous individuals speaking on behalf of the turf field, was that it was only a week since the national #ENOUGH gun violence protest at the high school yet NO ONE brought up the topic of a school safety and security budget. There was cheering for the turf field but not a mention about what measures will be taken to keep our students safe. Are our schools safe? I am not alone when I say, “I don’t think so.” Can more be done to protect students? Absolutely! Can we afford it? Well a million dollars would be a good start! But we need a Turf Field, correct? NOT. In the years since the Sandy Hook tragedy perhaps some measures have been taken to increase school safety and security but when parents ask specifically what they are, they are told details cannot be revealed because of security reasons. Carver stated, “Right after Sandy Hook there was a lot of evaluation of school safety and security, not only in the state of Connecticut, but nationally, and in that discussion there was a lot of legislation that was passed that really beefed up school security issues within the state and even at the national level, but certainly in Connecticut there was a lot of legislation that was passed to ramp up school security, and part of what they did is that they adopted a model, or an approach, on how schools actually rate security plans and it’s based on a FEMA model, an All Hazards Training.” (Specific legislation was not cited.) The schools were tasked to develop a very comprehensive plan, Carver said. The plan includes each school having a Special Crisis Team who are trained to deal with different crisis situations, she said. The lecture went on in a similar manner, talking about “protocol” … “working with other districts” … “working in teams” etc. (but no details given) but so far, we have to ask, what has been done regarding physical aspects of protecting the schools? Presently we have glass doors on the entrances, classroom doors made of simple wood, no real presence of police officer security (or other trained personnel) at entrances, no one to greet the person entering the lobby (okay, a student at a desk at the high school?) after they are “buzzed in” at the entrance based on visuals viewed via a camera, or sometimes showing an ID card. Students have lock-down drills in which classroom doors are locked, and students gather in the classrooms so they cannot be viewed through a classroom door window by a gunman, a door window is covered, and lights turned out. But are these measures enough? As the debate rages about what should be done regarding laws or guns or mental health etc., our students will remain at risk. Right now, we urgently need to “take away the target” by preventing a gunman from entering a school building and accessing classrooms. Many good reasons were presented at the budget meeting by people supporting the turf field but, in my opinion, none were good enough to warrant approximately a million dollars price tag. Tax dollars need to be used to protect our students and faculty FIRST. 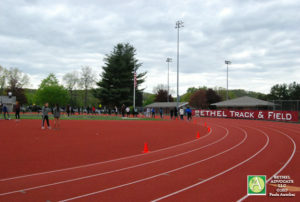 The skills required to compete at a high school level or even to become an Olympic athlete are not dependent on the composition of a turf field. To become proficient in a sport takes time, dedication, practice, diligence, preparation, a positive attitude, healthy lifestyle, physical ability, focus, passion, perseverance, energy, and effort. It takes money to implement an effective school security system. A new turf field would be great but not at the expense of safety. It’s a simple matter of priorities. VOTE NO on the turf field and YES on increased school safety measures.